Produced on the occasion of the 1993 Venice Biennale, Paik Nam-June’s “The Rehabilitation of Genghis-Khan” is one of the artist’s pseudo-robot sculptures that foresaw the coming of an age. 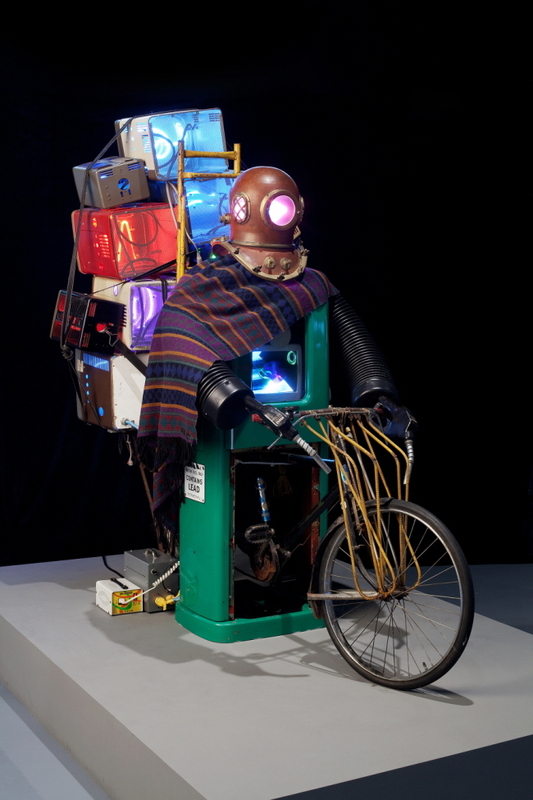 Riding a bike instead of a horse while wearing a diving helmet and carrying TVs on his back, the Kahn of the 20th century suggested a new paradigm of exchanges between human lives and multimedia technologies and data. Nam June Paik Art Center is currently holding two exhibitions -- “Datumsoria” and “Edge of Now” -- through Sept. 16 in collaboration with Chronus Art Center in Shanghai and Center for Art and Media in Karlsruhe, Germany. The two exhibitions focus on aspects of contemporary society where new technologies constantly shape and interact with human behavior. “Datumsoria” is a term concocted from the words “datum” and “sensoria.” The term relates to human acceptance and interpretation of data stimuli, implying a new kind of perception in the age of information and virtual reality. “Weight of Insomnia” comprises two large canvases installed on scaffolding, each with robot-controlled brushes that are set up to paint landscapes of sleepless cities. When pictures are sent from video cameras, the robots restlessly paint outlines of buildings, silhouettes of trees and car contours. For the exhibition, the two cameras are installed at Nam June Paik Art Center and at a building near the South Jeolla Provincial Government Office. Nicolai’s video installation work “unitape” is located in a separate room with loudspeakers. 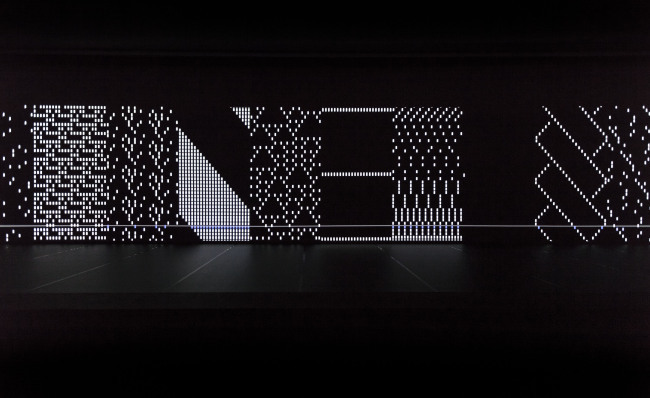 Projected on the screen are images the artist has developed on punch cards, an early form of digital media. Through the images and acoustic sounds of binary system, Nicolai tries to address the socio-psychological aspects of man-machine interaction. The exhibition was previously displayed at Chronus Art Center in Shanghai in 2016 and at Center for Art and Media in Karlsruhe (ZKM), Germany in 2017. “Edge of Now” is an exhibition that showcases works of relatively new artists. Three artists were selected from among 30 candidates: Kim Hee-cheon from Korea, Yang Jian from China and Verena Friedrich from Germany. In line with the “Datumsoria” exhibition, the three participating young artists present their own takes on contemporary reality thoroughly shaped through numerous technologies and the pushing of boundaries with technological development. Friedrich’s “The Long Now” is an installation work that takes a contemporary approach to soap bubbles. Conventionally implying transience and fragility, the bubbles are sustained with the help of a chamber that contains a controlled atmosphere. 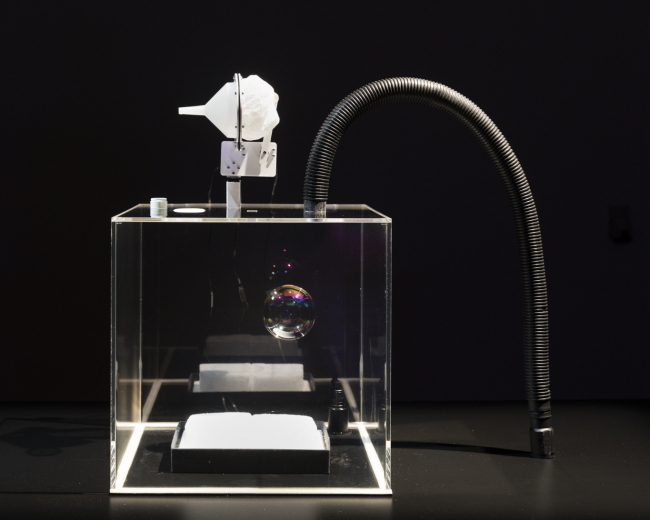 The bubbles’ transience and the machinery that keeps them alive seemingly represent the transitoriness of human life and technologies that run counter. Also included in the exhibition is Jian’s “Forest of Sensors,” which comprises everyday objects with sensors attached to them. The movements of visitors walking in the forest are detected by the sensors. Jian’s forest becomes a representation of how various technologies integrated into our daily lives shape our behaviors, perceptions and actions. Korean artist Kim introduces three video works that question virtual and physical realities alike. The group exhibition will travel to CAC in November this year and to ZKM in June 2019.